Discovering the Oregon Coast is a documentary film about all of the facinating things found along the Oregon coast. 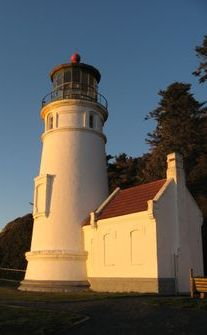 Heceta Head Lighthouse is a film about the early history of the lighthouse, and the lighthouse keepers and their families. Bohemia Gold Mines is a historical documentary film about the gold rush in Cottage Grove, Oregon. Crystal Rose Productions is a company dedicated to creating historical documentary films that not only entertain the viewer, but educate as well. Its been our purpose to try to capture the enchanting beauty of nature on film for others to enjoy. Each movie is a story that shows the earliest history of the subject, and how it evolves over time up to the present. These documentaries have been broadcast extensively on Oregon Public Broadcasting. OPB is the largest broadcast station in the state with over a million viewers, and its coverage area is the state of Oregon and southern Washington. We at Crystal Rose Productions are committed to presenting an ongoing succession of captivating movie titles about the alluring beauty and history of the state of Oregon. The Peter Iredale, was a beautiful clipper ship that ran aground on Clatsop beach on October 25, 1906.
of Florence Oregon, and was Illuminated in 1894.